In the background Toonie does a double take. Yellow. You know, I have noticed a lot of yellow lately; yellow boats and watertoys, yellow signs, yellow cars. Is this selective attention, burgeoning metro-sexuality (silly me) or a trend? Also legend has it the woods behind Deephaven Elementary is an el primo search area. Morel hunters are a quirky bunch. Some share their information freely with others... There is “The National Morel Mushroom Hunters Association” I suspect they all wear grey and brown spongy little hats and sit in dank rooms discussing their secret stashes. “Look in popplars and conifurs. Look on hill sides and railroad tracks. Look in places where the spores can get trapped. Its early yet. 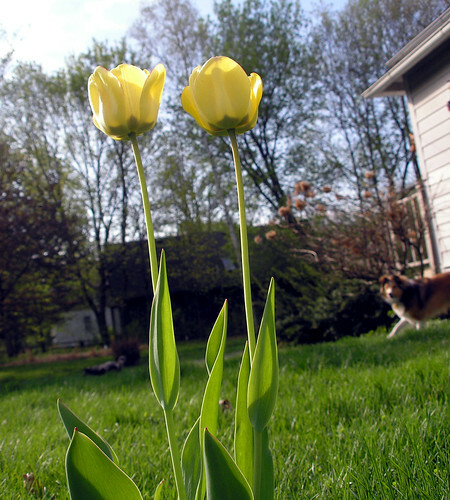 When the nights get warmer they'll start popping up. Usually any time from the 5th of may until the 10th of june youll find morels.When you start to see the fiddal heads (ferns) starting to come up is when your morels will be at there (sic) prime. Happy hunting”. Next to Purgatory Park, private property, security system. - A lovley anachronism. 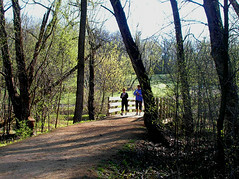 Two women jog over a bridge on the Purgatory Park Trail. The sun is rising. A mist hangs over the rushes of cat tails. But there is trouble in....Purgatory. A sign posted by the Minnetonka Parks Department warns of domestic animal assaults along the trail. Rules will be strictly enfornced! My advice: Run carrying a good stick. I stopped into Grays Bay on the way to work. 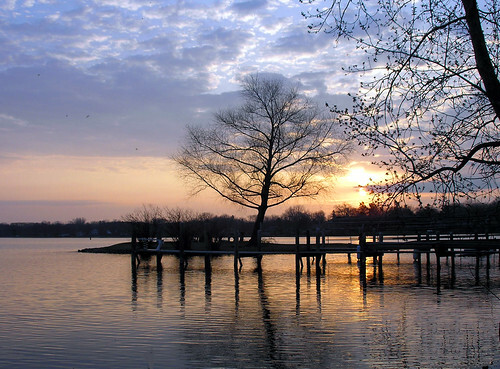 Are sunrises tranquil? Well, it was quite and the coffee in my silver travelers mug was strong. A woman strolled near the launch with her little dog and a mug of coffee. The docks had one lone boat. A flurry of sails caught my eye during an evening walk. This sail boat broke free of the group for a moment - east of Swift Point. My group shots were obscured by the still-bare tree branches at Rocky Beach. 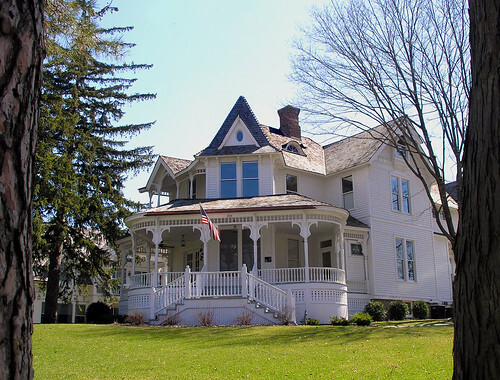 Originally build at the site of a villa called "Topside" built by a sickly John Hezekiah, who had moved to Excelsior to cure his tuberculosis. I can only speculate that he had heard of the curative properties of local spring waters that drew many health seekers to the area. Hopkins. The parking lot along the bicycle trail has and expaned parking lot. There, on the bumper of a shiny black Lexus sedan, was this bumper sticker: "My other car is a bicycle". I think, why not: "My other bicycle is an SUV", or "My other dog is a cat"? I enter into useless mental activity. Sometimes I have my doubts about the sincerety of the motives for using bumper stickers. Some lecture you, placing you in the position of being the hapless lectee... and I do not need that while I am driving. These are too many and too cloying to list. So there it is, the challenge: To find and identify positive, non lecturing, fun and funky bumper stickers. No inherent chiding allowed. Oh... the bicycle one is OK, really. The elusive Morel is spelled with only one "R". An archive of this site has a post with the name spelled "Morrel". This common mistake has googled many a visitor to this site. I will retain the mispelling. I apologize, unless you are one of the people who refer to mushrooms as "shrooms", then no aplology is in order (don't even mention the use of the term "veggies" for vegetables). 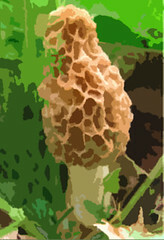 The word is out that Morel hunting will be fruitful in May along the Mississippi, near the old downed hardwoods in Carver County. Stay tuned for my woodland report. The Minneapolis StarTribune printed an article about Lifetime Fitness' (my health club) membership fees. It was an odd front page "hit piece' on Lifetime Fitness' odd membership structure. I was ready to go on a rant myself ... about the unfairness of the article, but after talking to my fellow members, I decided to do a rethink. I choose to pay membership fees at the "Advantage rate" of 80 bucks per month.I use the Crosstown club regularly. The "Advantage rate" allows me to go to my club and a variety of others with varying features. I am not allowed to go to the NEW Lifetime club 2 miles from my house, however. It is part of their elite plan (I do not know the plans name, but I do know it costs 119.00 per month) and has exclusive features that are too exclusve and fanciful for my wallet. There is a cheaper plan called the "Sports Plan" for 60 bucks a month. This article describes the tribulations of a member who is unhappy with the "Advantage" membership amenities at her club as compared with other clubs with the less expensive "Sports" membership. There are no "water parks', round-the-clock hours, and upgraded spas like the less expensive. That is true I guess, but there are some things the artcile does not state. Each club is unique. The enormous Crosstown Club has an indoor, 8 lane pool and in the Summer it has an outdoor pool and wading pool. 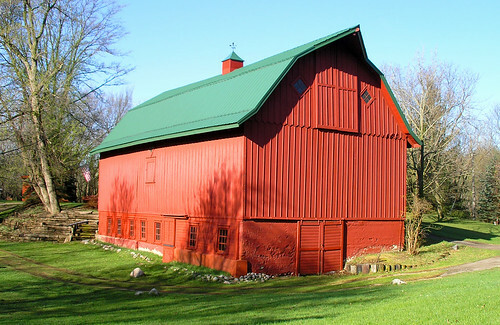 It has indoor Tennis courts. It has, in my opinion, a decent and useable running track. The smaller clubs do not have these features, or they have smaller versions. The article also mistates the cost difference between a Sport membership and an Advantage membership - $80 minus $60 equals $20, not $30 as the article mentions twice. Finally, why did I do a rethink? I agree, for different reasons, that Lifetime Fitness has membership fee problems. I am irritated that I would have to bump up 39 bucks a month more to use a nearby Lifetime Club - just because it has flatscreen TV above the whirlpool and a 2 story water fountain. 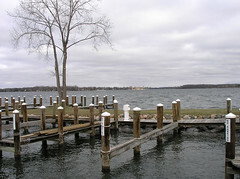 Lake Minnetonka Ice Out - Today's final note. The white caps on the lower lake toppled off the waters near Swift Point. St. Louis Bay. I could see open waters in the bays, - with a night time sub 20degree temperatures in the offering. The lake is open, but the cold waters forboding. 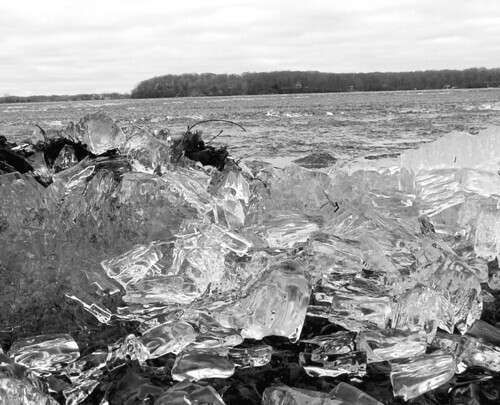 Ice shards are pressed up against the shoreline. Above, a lone Piper Cub perused the Lake... surveying the scene for a potential declaration. It is 17 degrees. The ground is covered lightly with snow. I am putting a flannel shirt on. For Minnetonkascenes the ice is not out. In the distance- Big Island. Shot from Fergusun Point. 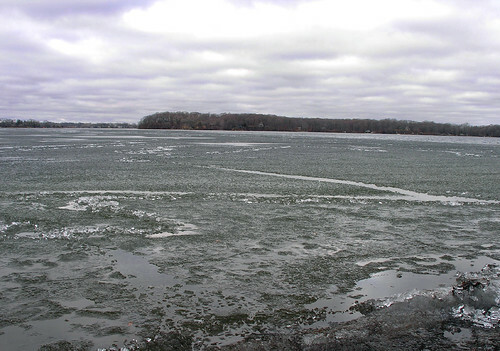 Welcome to the unofficial, temporary “Lake Minnetonka Ice Out “ monitoring page. 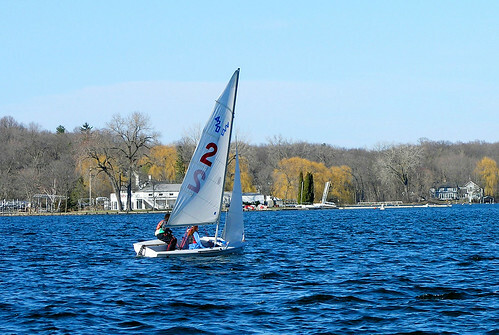 It is on this page that the author of Minnetonkascenes answers the question: Can I drop the boat into Lake Minnetonka without the fear that, while I am shouting “I’m the king of the world", I will smack into 10 inches of ice? Well folks it is April 2- see for yourself. That is what “ice out’ is for. 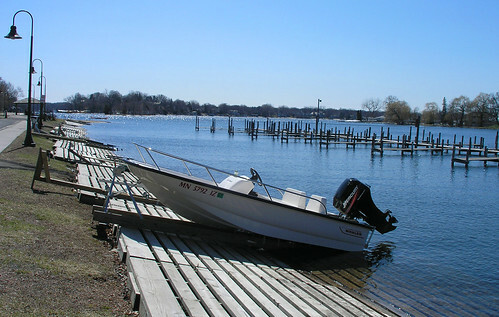 To tell boaters when the ice is off the lake. The Average ice out is April 15... according to another more official site. Open water in Excelsior Bay - Big Island in the distance from another angle.